Most of the world's major airlines fly into Athens Elefthérios Venizélos International Airport. From the airport you have a wide variety of choices of how to get from Athens to Ermioni. You can travel by hire car, by bus, by taxi or by boat. If you select to travel by boat you will have to get to Piraeus by taking a bus, taxi or metro train from the airport to the harbour, sailing with Hellenic Seaways from Gate E8. 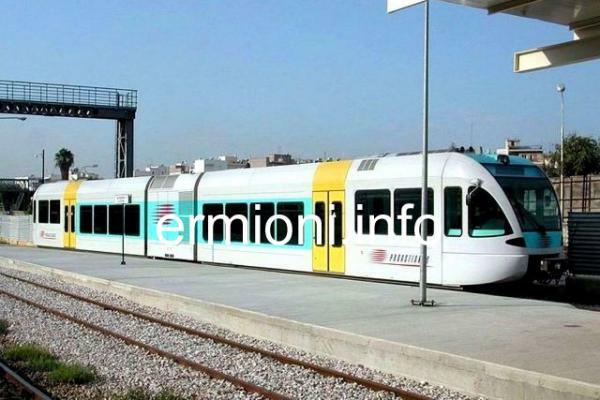 An alternative is to take the OSE train from the airport and travel via Kato Acharnai to Corinth. This journey gets you half way to Ermioni, the remaining part of the journey would have to be by taxi, bus or someone who would collect you from the train station. Most of the major car rental companies operate from Athens International Airport, with on-line bookings taken in advance. Prices will vary depending upon your specific requirements, personal driver details, the time of year and public holiday periods. Check that the rental prices quoted include all insurance. See the Athens airport to Ermioni driving directions below. Journey time is approximately 2.5 hours. POP's CAR rentals should also be considered, as they have an office in Ermioni and an office very close to the airport. Cars can be hired for weeks, days or a single one-way journey. Bookings can be made on-line, or if you wish to speak to the manager in Ermioni, the contact details are: Tel: +30 27540 31880 and +30 27540 31514, Fax: +30 27540 31881, Mobile: +30 694 808 4889. The Ermioni office manager, Gianna, can speak several languages and will be happy to assist in all your requirements. There are a couple of car rental companies in Porto Heli (18 kms from Ermioni) which could be checked out if POP's CAR rental cannot help you. Car rentals in Porto Heli can provide a 'delivery/collection' service for customers in Ermioni, by prior arrangement. HELI CARS Rent a car - Tel: +30 27540 52140, Fax: +30 27540 52340, Mobile: +30 694 228 5755. Travelling from Athens International Airport you will need to get to the port of Piraeus, Gate E8. This can be done by bus, train or taxi, all available just outside the main airport terminal. The X96 bus, which stops outside the airport terminal (arrivals) between exits 3 & 4, leaves for the port of Piraeus every 30 minutes, 24 hours per day. Ticket price is 6 Euros per person, one way. Buy your ticket from the ticket kiosk before travel and remember to validate your ticket in one of the machines on the bus. Depending upon the time of day, the journey from the airport to Piraeus can take between 1.4 and 1.75 hours, so allow plenty of time. Across the road from the airport terminal is the railway station where you can get the ATTIKI METRO train, which will take you from Athens airport to Monastiraki station, where you change lines onto the ISAP METRO train for Piraeus. Metro cost is approximately 10 Euros per person, one way. The total train journey time is approximately 1.2 hours. Taxis are available outside the Athens airport terminal where you could take a taxi directly from the airport to the port of Piraeus. Cost is approximately 60 Euros if travelling during daylight hours. Journey time is approximately 1 hour. On arrival at the port of Piraeus, the terminal station is at Karaiskaki Square, which is near Gate E8. Make your way over to the Hellenic Seaways ticket office as you must buy your ticket(s) prior to boarding. Check Hellenic Seaways for sailing times, information and on-line bookings. The journey to Ermioni by the smaller 'Flying Dolphin' takes approximately 2 hours, the larger 'Flying Cat' takes approximately 2.3 hours, with most sailings first calling at Poros, Hydra and then Ermioni. 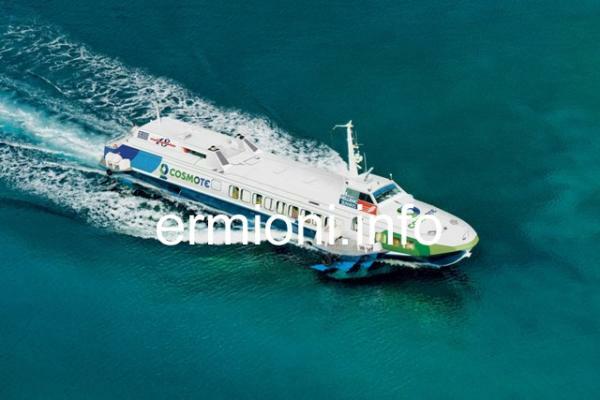 The ticket prices from Piraeus to Ermioni are 32.00 Euros per person, one way. Bookings and Customer Service - Tel: +30 210 419 9000. Always check sailing times prior to departure, especially during public holidays, as Hellenic Seaways change or cancel certain sailing times without notice. If you are sailing into Ermioni yourself, or wish to know information about mooring your boat, you may need to contact the Hellenic Coast Guard (Port Police) in Ermioni. Tel: +30 27540 31243 or email: ermioni.hcg@gr English spoken. The Hellenic Coast Guard office is located at the Western end of the main Limani harbour, near the entrance to the weekly Thursday farmers market. The X93 bus, starts at the airport terminal (arrivals level) between exits 2 & 3, leaves for Athens Kifissos InterCity bus station every 30 minutes, 24 hours per day. Ticket price is 6 Euros per person, one way. Buy your ticket from the ticket kiosk before travel and remember to validate your ticket in one of the machines on the bus. Journey time to Athens Kifissos InterCity bus station is approximately 1.2 hours. From Athens Kifissos InterCity bus station (departure point 36-37 for Argolida) KTEL InterCity buses travel direct to Kranidi, via Isthmia (Corinth Canal). The KTEL InterCity bus terminates at the Hotel Ermionida in Kranidi, opposite the Regional Health Centre. Kranidi is only 10 kms from Ermioni. Local KTEL buses travel from Kranidi to Ermioni at 08:10 - 11:10 - 13:15 - 20:00 Monday to Friday only. A taxi from Kranidi to Ermioni will cost approximately 15 Euros. From Kranidi Ermionida Hotel, KTEL InterCity buses depart to Epidavros (Ligourio), Isthmia (Corinth Canal) on to Athens Kifissos InterCity bus station, at 05:30* - 11:00 - 14:45 via Nafplio - 17:30 throughout the week (* no 05:30 bus on Sunday or bank holidays). Tickets are available from the Ermionida Hotel reception area. The cost of a taxi direct from Athens International Airport to Ermioni is approximately 240 Euros. 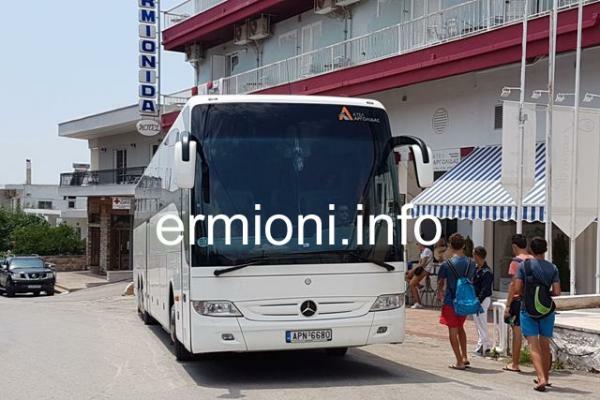 There are taxis available outside the airport main terminal, but if you wish to book a taxi to collect you from Ermioni, the taxi rank number is: +30 27540 31060. English spoken. You would need to leave your name, flight number, date and time of arrival. Journey time is approximately 2.5 hours. Trains run from Athens Airport to Corinth (Korinthos) leaving at 09 minutes past the hour, every hour, starting at 06:09 until 22:09. There is a change of trains at Kato Acharnai, where you have to cross the platform for the connecting train. Athens Airport railway station is located opposite the central front doors of the main airport terminal. Cost of railway journey is approximately 12 Euros per person, one way. OSE train times are available on tickets.trainose.gr Journey time is approximately 1.5 hours. The return train journey from Corinth (Korinthos) to Athens Airport leaves at 14 minutes past the hour, every hour, starting at 05:14 until 20:14. Journey time is approximately 1.5 hours. The Corinth railway station is located approximately 6 kms West of the major Isthmia/Corinth Canal E94 motorway, junction 10. Leave Athens airport and follow the signposts marked for Athens. Turn right for Athens and Elefsina, joining the ATTIKI ODOS motorway. This motorway connects with the E94 motorway, once you pass Athens, Piraeus and Elefsina. Continue and follow all signs for Elefsina and then Corinth. Continue West and follow all signs for Corinth (Korinthos) until you see the exit signs for Corinth/Loutraki and Corinth/Epidavros. The exit slip roads come up immediately after these signs. 1st sign for Corinth/Loutraki is exit 8. This exit will give you an opportunity to cross the old road bridge of the Corinth Canal and stop for refreshments. From the old road bridge, continue to the traffic-lights and turn left for Epidavros and Spetses. 2nd sign for Corinth/Epidavros is exit 10. This is the exit to take if you do not want to cross the old road bridge of the Corinth Canal, and wish to continue on your journey instead. Coming off the motorway at exit 10, turn left at the bottom of the slip road and follow all signs for Epidavros and Spetses. 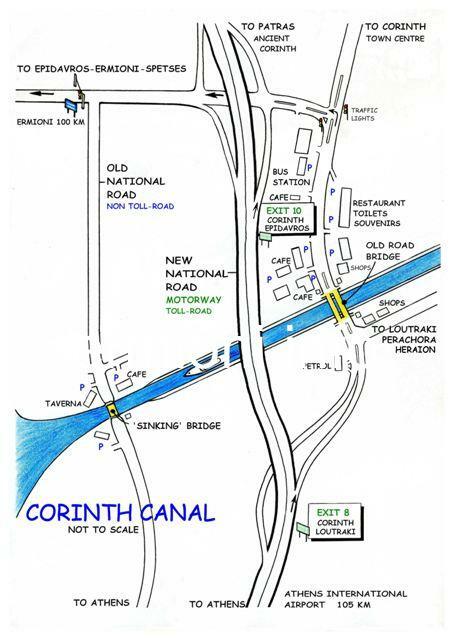 (See the Corinth Canal motorway junction layout in the picture gallery below). Stay on this main road heading South and the journey will take you through some spectacular scenery, especially when you travel through the mountains. Some villages you will pass en-route are: Loutro Eleni, Almiria, New Epidavros, Archaic Epidavros, Koliaki, Trachia, and Fourni. Contine on the main road until you come to a right turn which has many signs for Poros, Spetses, Porto Heli, Kranidi and Ermioni. This is the exit you need to take. At the bottom of this exit slip road, turn left, drive under the road bridge and follow all signs for Spetses, Porto Heli, Porto Hydra and Ermioni. Passing this road bridge, the road divides at the roundabout, take the right hand road which is marked Spetses. From this point you will start travelling through the mountains. There will be some places which have fantastic views of the Argo-Saronic Gulf and the islands. The road through the mountains will also be full of S-bends. Please drive carefully and be cautious. Once you have started to descend from the mountains near the village of Fourni, continue on the main road. You will pass Kilada on the right hand side, and will be approaching the market town of Kranidi. Look out for LIDL supermarket which is on the right hand side, because soon after, the main road divides into 3 roads at the roundabout. Take the left hand road for Ermioni and continue for approximately 9 kms. Upon approaching Ermioni, this road has a right hand turn off, which is for Ermioni only and the one you must take. The road sign at this junction for Ermioni is in Greek only. Once you reach the sea, you will have arrived at the main port of Ermioni (Limani) with the Hellenic Post Office on the right side. The distance from Athens airport is 206 kms and the journey should take approximately 2.5 hours, unless you stop en-route. Leave the new South Port of Patras, and head North-East, following the signposts marked for Athens and Corinth. You will then be travelling East, on the E65 motorway, along the Northern coastline of the Peloponnese. The existing motorway from Patras to Corinth has been under re-construction for many years, with many sections of the road being single lane, having 50km and 60km speed limits. Historically, this motorway used to be the most dangerous road in the whole of Greece, so please drive carefully. Continue East towards Athens, do not cross the new Rio suspension bridge, unless you wish to explore Central and Northern Greece. After passing the Corinth junction on the E65 motorway, come off at the Epidavros/Isthmia junction exit 10. At exit 10, turn right at the bottom of the slip road and follow all signs for Epidavros and Spetses. However, if you wish to see the Corinth Canal, take a break, or stop for refreshments, then turn left at the bottom of the slip road and drive up to the traffic-lights at the T-junction. At the traffic-lights, turn right, and you will see numerous cafes, fast-food tavernas and tourist shops on both sides of the road. You can park at any one of these places, then head to the far end of this stretch to walk across the road bridge of the Corinth Canal. To continue your journey to Ermioni, return to the traffic-lights and turn left, and follow all signs for Epidavros and Spetses. (See the Corinth Canal motorway junction layout in the picture gallery below). Continue on the main road until you come to a right turn which has many signs for Poros, Spetses, Porto Heli, Kranidi and Ermioni. This is the exit you need to take. The distance from Patras South Port is 240 kms and the journey should take approximately 3.2 hours, unless you stop en-route. If you wish to leave your suitcases at Athens airport to explore the capital upon your return journey, or upon arrival, the baggage area is on the lower level by Section A arrivals. The cost is 8 Euros for a large case and 6 Euros for a medium case or bag, for up to 12 hours. Thereafter, the cost is 1 Euro extra per case/bag, for a further 6 hours. Greece's Aegean Airlines has been named 'Best Regional Airline in Europe for 2019' after winning numerous awards in 2018. Olympic Airways is a subsidiary of Aegean Airlines and services most of the domestic routes within Greece and the Greek islands.